The BMW M62 is a V8 DOHC piston engine which replaced the M60 and was produced from 1994-2005. Compared with its M60 predecessor, the M62 features Alusil cylinder liners (in markets where high sulphur fuel was sold) and a single row timing chain. In 1998, variable valve timing (called VANOS by BMW) was added to the M62. The M62 engine block is made from Aluminium with Alusil or Nikasil cylinder liners, depending on the country of intended sale. The M62 is fitted with Sequential fuel injection and double overhead camshafts with 4 valves per cylinder. It also sports fracture-split forged connecting rods.Variable valve timing is fitted to the later "M62TU" variants. In 1998, VANOS was added and the engine was named "M62TUB35". In 1998, VANOS was added and the engine was named "M62TUB44". The M62B46 is a (4,619 cc (282 cu in)) version producing 255 kW (347 PS; 342 hp) and 480 N·m (354 lb·ft) of torque. The stroke is 85 mm (3.3 in) and the bore is 93 mm (3.7 in). Technically this engine is similar to the M62TUB44, with double VANOS on both the intake cams and exhaust cams. This engine developed byAlpina is based on the M62TUB44. The M62B48 is a (4,837 cc (295 cu in)) version producing 276 kW (375 PS; 370 hp) and 510 N·m (376 lb·ft) of torque. The stroke is 89 mm (3.5 in) and the bore is 93 mm (3.7 in). Technically this engine is similar to the M62TUB44, with double VANOS on both the intake cams and exhaust cams. This engine developed byAlpina is based on the M62B46. 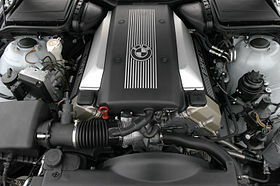 The S62 engine (also known as S62B50) is a high-performance variant of the M62 which is fitted to the E39 M5 and E52 Z8. It is enlarged with a bore of 94 mm (3.7 in), a stroke of 89 mm (3.5 in) and a displacement of 4,941 cc (302 cu in). It shares its basic architecture, including aluminium block, with the M62 engines. Previous M5 engines were assembled at M division headquarters in Garching, Germany but the S62 M5 engines were assembled at the Dingolfing assembly plant. Eight individual throttle bodies (one per cylinder) control the airflow into the engine, these throttle bodies are electronically actuated (often referred to as "drive-by-wire"), with a setting for the driver to select "normal" or "sport" mode throttle response. Bosch Motronic version MSS 52 is used to control fuel injection, ignition timing and other functions. Variable valve timing is used for both the intake and exhaust camshafts, the S62 was the first BMW V8 engine to incorporate this feature. The compression ratio is 11.0:1 and hollow camshafts are used. While the M62 engine uses a single-row timing chain, the S62 uses a double-row timing chain. The S62 engine produces 294 kW (394 hp) at 6600 rpm and 500 N·m (369 lb·ft) at 3800 rpm. The redline is 7000 rpm. 2001/10. The thickness of VANOS diaphragms were thickened, thus the sound of VANOS were significantly reduced.